Well folks, the day that many people thought would never come, has actually come. Ian and I decided to procreate! Baby g is due on November 4. That makes me at 14 weeks along (3 1/2 months). So far, things are going quite well. 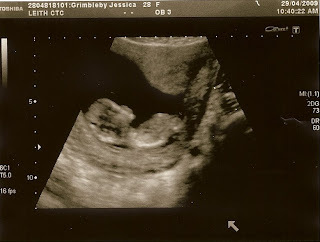 When we had the scan a couple weeks ago, we got to see the baby moving its arms and legs and bouncing all about. It was quite exciting. And at that point, it was 2 1/2" long. Yesterday, we told our families. Having kept this a secret for quite a while now, it is nice to have it out in the open for everyone to enjoy! I am sure you will be hearing more about this baby in blogs to come! Look at Baby G's profile! Love it! I cannot wait to meet Baby G in person.